You can use security certificates on your BlackBerry PlayBook. Digital certificates, also called security certificates, are encrypted, locked documents that prove your identity as a user, or prove that a website or other Internet destination is the place it claims to be. You’ve been involved in this authentication process if you use a browser to visit your bank’s website. This is an area where few individual users become personally involved; an IT department or a network security agency will instead configure websites and provide special instructions to users of computers or tablets like the BlackBerry PlayBook that seek to use them. If you’re instructed to import security certificates to your PlayBook, do the following. But before you start, make sure you get in touch with an IT pro and find out the class and the certificate store (or stores). Connect the PlayBook to your personal or laptop computer using the USB cable. On your computer, locate the certificates you want to move to the tablet. 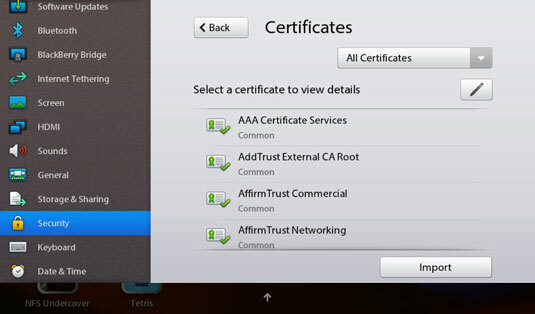 Drag and drop the certificates from the computer to the folder on your BlackBerry PlayBook called Certs. On the PlayBook, swipe down from the top bezel of the tablet. Tap the gear icon in the upper-right corner of the browser status panel. Tap Security (in the panel options on the left side of the screen). From the Security panel, tap Certificates. Based on instructions provided you by an IT professional, select the class and the certificate store or stores to be used. This same screen also allows you to tap an existing certificate to view its details. You can delete a certificate by tapping the pen icon and then tapping the X next to the certificate.